**NOTE! 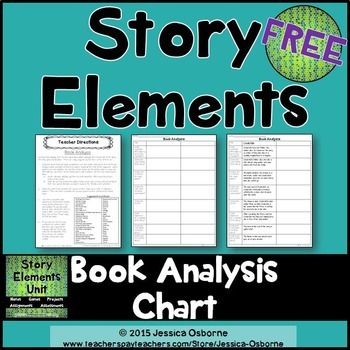 This entire product is a part of my STORY ELEMENTS UNIT which includes notes, games, quizzes, projects and assignments on the story elements! 1. Detailed teacher directions with a list of suggested picture books for analysis. 1. Supply a large selection of children’s picture books at the front of the classroom. Allow partners to work together to read four of the books and fill out the chart on each one. 2. Allow the children to complete one column on their class novel (with or without a partner.) Then have them complete the second column on their independent reading book.